or: The big Oscar nominee. One word to sum it up: Uplifting. To be perfectly honest, I was a little disappointed by The King's Speech. I think I was expecting the most amazing movie ever, because of all the hype. It didn't reach the highest of heights I'd had set up for it. However, despite my minor disappointment over this movie, it was pretty awesome. Well acted, if anything. Dear God, I think I would die if I had a stutter. 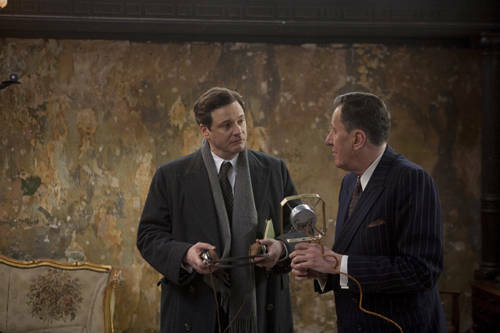 The King's Speech tells the story of the man who became King George VI (Colin Firth), the father of Queen Elizabeth II. After his brother (Guy Pearce) abdicates, George ('Bertie') reluctantly assumes the throne. Plagued by a dreaded stammer and considered unfit to be king, Bertie engages the help of an unorthodox speech therapist named Lionel Logue (Geoffrey Rush). Through a set of unexpected techniques, and as a result of an unlikely friendship, Bertie is able to find his voice and boldly lead the country through war. A film about British royalty shouldn't be as exciting, nor as uplifting as The King's Speech is. This film has everything: drama, comedy, history...but most of all, it works as a very scary thriller. I swear, when this movie came to it's climax, I was on the edge of my seat. This was Colin Firth's film, because I'm not sure if one actor, on his own, can generate that much intensity in one scene. I don't even know how he managed to master that stuttering. All I know is that it was painful to watch him, but thankfully, it was the kind of pain that an Oscar is made of. I may have been a huge Eisenberg fan before, but after seeing Colin Firth's performance, if he doesn't get the Oscar, then that will be the biggest mistake the Academy has ever made. Tom Hooper does a flawless job of directing, along with some enchanting cinematography. The script does a good job of telling the story simply, but intertwining various parts of history successfully without becoming a bore. Alexandre Desplat's score is, as always, a perfect touch to a great film. While the film belongs to Firth, there are three other standout performances within this film. Perhaps the best is Geoffrey Rush, who serves as some comic relief, and is forever attempting to outshine Firth (sometimes he does). Helena Bonham Carter is angelic as Queen Elizabeth, and, surprisingly, fits the royal role very well. The one that everyone would probably forget is Guy Pearce, who is simply amazing in this film. Why do people underrate him so much? He has come such a long way since the days of Neighbours. Right when the credits rolled I wanted to stand up and cheer. It's a gem of a film, which deserves whatever accolades it will be getting. It just wasn't amazing. THE VERDICT: The feel good hit of the year which also had some fantastic performances, particularly Firth's. Exquisite viewing. I must disagree on Guy Pearce comment. He is a very good actor, but in The King's Speech he seemed to me a terrible miscast, not only because he was younger than Firth, but because it appears to me that this role was definitely written not for him. At first, I was a little iffy about Pearce. But then I just adored him, as I do in any other movie. The age thing was a little strange though.